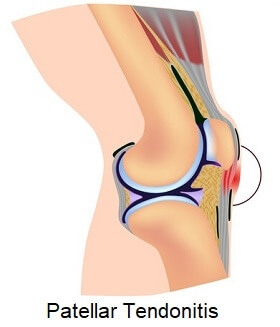 Patellar tendonitis, also known as Jumpers Knee, is caused by damage to the patella tendon just below the kneecap. It causes pain and tenderness below the knee and limits activities. Repetitive sporting activities such as kicking and jumping place a large amount of strain on the tendon resulting in microscopic tears, inflammation and the gradual onset and progression of pain. Effective treatment is vital to prevent patellar tendinitis from deteriorating until the tendon ruptures completely. 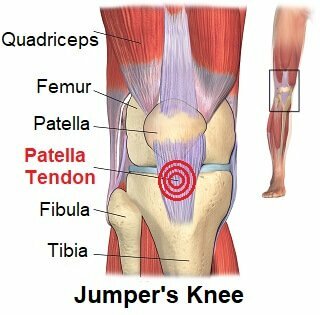 Here, we will take a look at the common causes of patellar tendonitis, typical symptoms, how it progresses and the best treatment options for Jumpers Knee. The patella tendon is the most common place to develop knee tendonitis. It can be found at the front of the knee just under the kneecap and it attaches the quad muscles to the top of the shin bone. The tendon is approximately 2cm wide, is extremely strong and its job is to work with the quadricep muscles to straighten the leg. Patellar tendonitis develops when there is repeated excessive force placed on the patella tendon, usually during sports. The greater the force, the more damage is done. Jumping and landing places a huge force on the tendon approximately ten times body weight. To be able to jump, the quads have to work with the calf muscles to propel the body off the ground and during landing, the quads work have to work again to stabilise the leg. Another common cause of patellar tendonitis is repetitive kicking, which places a force approximately seven body weight on the tendon. If someone is doing lots of kicking or jumping, e.g. 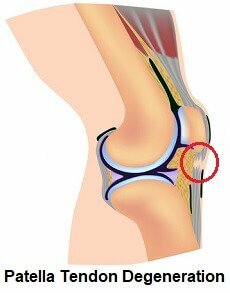 sports players, the strain on the patella tendon becomes too great and microscopic tears develop in the tendon. This may not cause pain initially, but as it progresses and more tears develop, the knee will get gradually more and more painful. These microscopic tears make the tendon less strong and therefore prone to further damage. The tendon may even completely tear with severe patellar tendonitis. Patellar tendinitis usually comes on gradually over time, rather than being caused by a specific incident. The symptoms of patellar tendonitis tend to get worse over time, increasing in frequency and intensity. Jumpers Knee is often misdiagnosed as Runners Knee, Osgood Schlatters or Chondromalacia Patella, but the most defining characteristic of Patellar Tendonitis is tenderness when you press on the patella tendon, just below the kneecap. Stage 2: Pain with initial activity that disappears as you warm up, but returns after activity. Performance is not usually affected. It used to be thought that inflammation was the main cause of Jumpers Knee, hence the name patellar tendonitis (itis = inflammation). However, recent studies have shown that an inflammatory response is actually very rare. It is actually more common to have degeneration i.e. wear and tear of the tendon. As a result health professionals now often refer to it as Patellar Tendonosis (osis means degeneration). This explains why non-steroidal anti-inflammatories like ibuprofen often have little effect on the symptoms of patella tendonitis and they can actually make things worse by slowing down healing. The body recovers from the degeneration associated with Jumpers Knee by producing collagen that repairs the tissue damage. However, this is a slow process and it takes approximately three months for sufficient collagen to be both laid down and to mature fully in order to allow the tendon to return to full strength. Patellar tendonitis is one of those cases where the saying “no pain no gain” does NOT apply. It is really important to rest completely from any activity that causes pain to allow the tendon to heal. It may be up to 3 months before you can return to sports after suffering from Jumper's Knee. 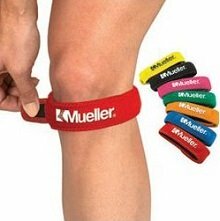 In the early stages of Jumpers Knee, knee straps can work really well to reduce the stress going through the patellar tendon and alleviate symptoms. They reduce the cross sectional area of the tendon and the pressure applied by the strap reduces the force going through the tendon. Visit the knee strap section to find out more about them, including recommendations based on users feedback. Ice packs applied for 10-15 minutes every couple of hours, before and after activity can help to reduce pain. Visit the Ice Treatment section to find out how to safely and effectively use ice therapy and the ice wrap section for the best ways to apply ice. Tightness in the hips, quads and hamstrings increases the risk of developing Jumpers Knee so it is important to stretch these muscles out. This will not only help the pain and stiffness at the knee, but will also help reduce the chances of the symptoms returning when you start back at your normal activities. Visit the knee stretches section for simple tests you can do to see if your muscles are tight and find out the best way to stretch out. Weak glutes can affect the position of the knee and lead to increased force going through the patellar tendon, resulting in tendonitis. The simplest way to strengthen the glutes is through Clam and Bridging exercises – visit the knee strengthening section to find out how to do these. Eccentric exercises can also be helpful, this is when you strengthen the muscle as it lengthens, rather than the usual approach of strengthening it as it shortens. If patellar tendonitis fails to resolve after 6-12 months of rehab, surgery is performed as a last resort. Surgery involves removing the degenerative tissue and looks to increase blood flow to the area to promote healing. If the patellar tendon ruptures (tears completely), surgery is required to repair the tendon by sewing it back together. After surgery, careful rehabilitation is essential as the tendon will be weak and it usually takes 3-6 months of physical therapy to return to sports. There are a number of other conditions which produce symptoms similar to Patellar Tendonitis, such as Runners Knee and Chondromalacia Patella. If this doesn’t seem quite like your pain, see the Front Knee Pain section to find out about the most common causes of pain at the front of the knee, including causes, symptoms and treatment options.